Oops - we don't appear to have a video for the fi-5530C. The Fujitsu Fi-5530C document management scanner offers high speed scanning at 45ppm (150dpi) and 35ppm ( 200dpi) in both colour and mono. 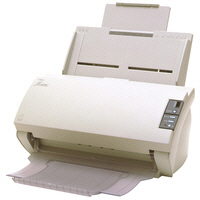 The duplex facility of the Fi-5530C allows the contents of both sides of a documents to be captured in one pass. High speed colour images at up to 600 dpi can be scanned using the built in JPEG compression. Bundled with the Fi-5530C is Adobe Acrobat 5.0 allowing users to easily convert documents to PDF files, the de-facto standard for electronic distribution. The Fi-5530C has both a SCSI-2 and USB 2 interface providing true plug and play flexability, It can reliably detect double feed documents using its ultrasonic detectors. It also offers de-skewing and auto-cropping.